High functionality with simple operation. Web Content Management can`t get much easier. contentXXL - high functionality with simple operation. Create websites, forums or blogs without any programming knowledge. Thanks to innovative drag & drop functions, creating templates is a breeze. 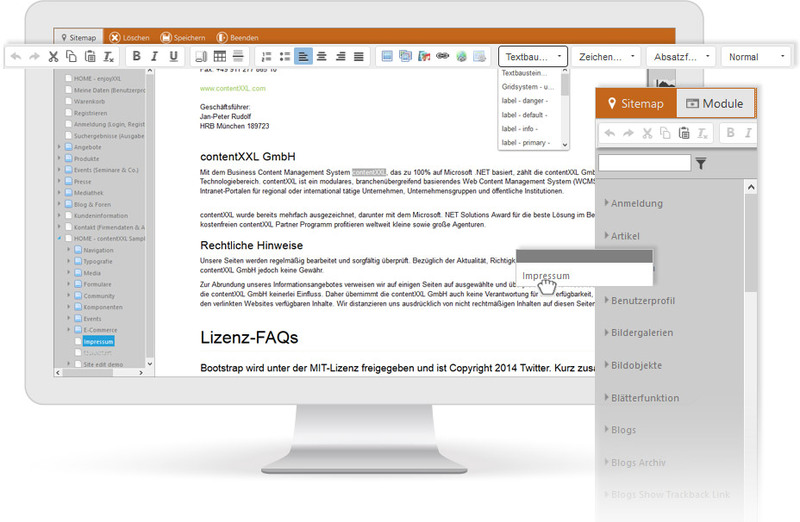 Edit content directly on the website or in the easy-to-use WCMS back-end. Search engine optimized and responsive design. Jetzt ausprobieren und CMS probefahren! Our CMS supports your business! Efficient editing processes, simple CMS integration, and need for less additional software accelerate processes and reduce time and costs spent..
Modular design, continuous development, and absolute scalability offer maximum flexibility and protection of your investment. contentXXL asp.net CMS is continually evolving and thus responds to the changing demands of content management systems. We are driven by a vision of allowing intelligent content to be created for more efficient and better content marketing. Online documentation can answer important questions about the installation and operation of our asp.net CMS. Problems with contentXXL asp.net CMS? The contentXXL help desk is here as your knight in shining armor.